I was at a pawn shop today (You never know what you might find,) and found 3movado gold case black dial with the yellow gem 12. Two of them where matching one of them was a little different in style. Problem is, He's wanting 110 each, Now from the matching ones I've found online that is way too low to seem real. So my question is:How do you tell a fake from a realmovado? is there any words on the dial that differ like if it says swiss made. or should I get the S/N numbers and contactmovado and see if they have them on record? I want these watches, But to find out they where fake after I bought them would be a bit disheartening. Time was made so everything does not happen at once. Best bet would be to run down the serial #s and see if they match the watch as in the pic short of opening the case back.If the pawn shop would open the case backs you can be sure if its the real thing too. I have owned a couple Movado's and they do say Swiss Movado Made at the 6. We can discuss how to determine a fake , but please do not discuss buying or owning fakes. It's illegal and something we do not discuss on the forum. Posts mentioning this were deleted. So by the sounds of it at 110 each are they worth the work and time trying to investigate them or should I just move on? I personally like them so I would like very much for them to be real but with all the fakes out there it's not likely I fear. They could be real and the pawn shop just priced them low. If you like them, try and find out if they are real. Also you can check TJMaxx and SAMs club for good deals on Movados. Very nice idea, Come to think of it I am almost 100% I saw one of these at TJMaxx. They where asking something close to 700 +/- I can't recall. 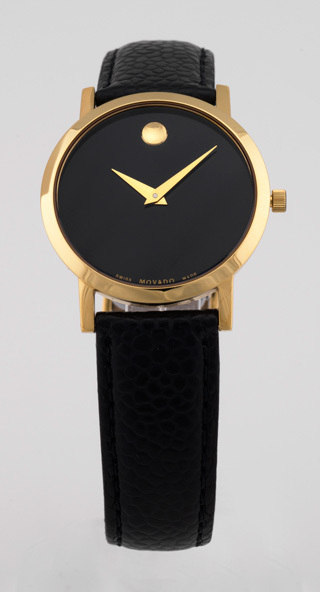 Movado watches can sell fairly low $110.00 sounds like a Pawn Shop price to me they probably paid $50.00 for it. I have bought them preowned for a lot less $75.00! The watch in your pic is the age old Classic Movado Museum Watch. Pretty basic watch with the liquid dot at the 12 position supposedly to be the sun at high noon?? What about Midnight? Never sounded right to me. Anyway real Movados can be bought very cheap. New I have seen them as low as $275.00 on sale at some of the discount Etailers. Of course because of the very simple design they have been knocked off Ad nauseam almost as much as Rolex has been knocked off. I study fakes all the time so I won't be taken in a sale. I see them for sale all over the place. You see the fake Movados at Flea Markets for as low as $5.00!! Usually they have really cheap quartz movements and inside the case back it's usually marked CHINA. I have to say because of the simple design they are easily copied and very hard to tell by looking at them. Even the weight can be deceiving. Now with Laser etching they can copy the case back design and serial numbers pretty good. The key in finding out if it's real or not is taking them apart. Yes. I got a 99-C6-1881 and found out the battery was dead so I opened it and the inside is far different then I though it was going to be. It's even an 8jewel movement. So I was kinda shocked to see that kind of work in a battery watch. At any rate. I ended up buying all 3 of them, And went to another pawn shop and found the matching her's. so it made a lovelyanniversary gift to my parents. And I've opened them and they all read movado on the workings and just have more quality then a fake would have. I wouldn't buy anything from a pawn shop. That's just me though. Glad you got a deal, I Have bought a lot of items in pawn shops over the years and never was disappointed. Not many watches but a lot of musical equipment. 99% of the time if it's a solid metal back the movement will never have the name of the company stamped on it. You'll find a cheap Chinese or Japanese quartz mov and China stamped on the inside of the back. A few times I have seen knockoffs with Miyota mov. The only time you'll find the brand name on a movement is if it has an exhibition back. Then you'll have to go over it with a fine tooth comb. Most do not have the all detail the real deal has. The other thing is the details won't be as crisp. They use a lot of photo and laser etching for the lettering on the case backs. It will not be pronounced or as deep as the real deal. I saw a guy wearing a U Boat. I know from mine that the lettering on the side of the case is very crisp and deep his looked like it was just etched in the metal otherwise you would never tell. As far as Movados go I see them all the time especially the older Quartz Museum watches. They sell for as low as $100.00 for the ones with a leather strap and the metal bracelet ones for no more than $200.00. These sold new pretty cheap any way compared to some other brand name watches. Movado uses ETA or Rhonda movements and marks them or has them marked MOVADO usually you can find ETA or Rhonda etched in very small letters. I forget when the trasitioned from one to the other but both would be real. It's always good to carry a Jewelers loupe with you. I do and it's a great help when you shop used/preowned. It won't hurt if you ask if it can be verified by a jeweler but be prepared the guy will probably get pissed. Pawn shop owners don't like the fact you might be insinuating they are ripping you off or they might not know what they are doing. LOL I use my smart phone a lot when buying new or used. If you have a good phone you can compare prices and pictures of the real deal. I have a Movado coming sometime soon. I don't know if it's real or fake but I would say more than likely it's real his ex wife gave it to him and she probably bought it at a high end jeweler. He is giving it to me for some work I did for him. It needs a battery so I will have it apart. I will take some pics of the mov with my macro lens and post them for reference. Excellent advice and information. Here is a little more. If it says Swiss Movado Quartz on the lower 6 o'clock position, it is not necessarily a fake. It just means that the Movado was made before 2000. Also look at the pins if it has a metal band. Movado uses screw in type pins. The only true way is to remove the back of the watch. The back cover may be stamped china and thats okay because some of movados casebacks are made there. The insides where it counts though should say Zenith, movado, or swiss ETA, Ronda, or ETW swiss. Anything marked china, singapore, thailand, or Japan is fake. I got a Movado museum model 0606703 second hand,it's solid black except the stainless back.it looks good,it's marked Swiss Movado made at 6 and Swiss Movado made lower back.My jewelry removed the back,the movement is marked Japan movement!What do I have?Did someone remove the Swiss movt. And replace with cheap Japan movt. Pawn shops are full of fakes. Sometimes they are aware, and sometimes they are ignorant. Do the checks listed above.